King of quirky films Wes Anderson (Rushmore) wowed critics and moviegoers with his comedy The Grand Budapest Hotel. 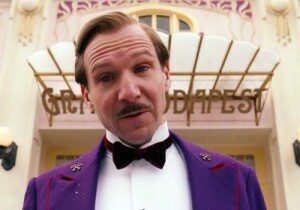 The film gathers a bunch of stars, led by Ralph Fiennes (The Invisible Woman) as Gustave H., the legendary concierge at the famous European hotel. Inspired by the works of Stefan Zweig , the movie follows Gustave’s many adventures with the lobby boy (Tony Revolori, The Perfect Game) who becomes Gustave’s most trusted friend. Together they must hold the hotel together amidst the theft of a priceless Renaissance painting, battle for an enormous family fortune and a changing Continent between two wars. Rated R, the rest of the cast of The Grand Budapest Hotel also includes F. Murray Abraham (Inside Llewyn Davis), Adrien Brody (Wrecked), Willem Dafoe (Platoon), Jeff Goldblum (Morning Glory), Harvey Keitel (The Last Godfather), Jude Law (Sherlock Holmes), Bill Murray (Get Low), Edward Norton (Red Dragon), Saoirse Ronan (Byzantium), Jason Schwartzman (TV’s Bored to Death), Tilda Swinton (The Man From London), Owen Wilson (Hall Pass) and Tom Wilkinson (The Kennedys). Phew! The film was highly praised by both critics and moviegoers, earning 92% and 89% approval, respectively, according to Rotten Tomatoes. The Grand Budapest Hotel grossed a tidy $52 million in theaters, Anderson’s second-highest-grossing movie after 2001’s The Royal Tenenbaums. and digital copy on the Blu-ray.